Each cell in the human body has 2 meters of DNA. 2 meters is a little more than 6 feet 5 inches which is about the height of Michael Jordan. But how do we fit 1 Michael Jordan’s worth of DNA into a cell nucleus that is 1/50th the width of a grain of table salt? In order to fit that much DNA into the nucleus, the cell has to do some serious Tetris. Unfortunately, we don’t know exactly what kind of Tetris the cell is doing because DNA is SO thin that we can’t see it accurately in the nucleus even with the most powerful microscope. Thanks to previous research, everyone agrees that the first level of DNA folding is when the DNA wraps around proteins called histones. If you’ve ever tried to pack up some Christmas lights, you know that wrapping them around something is key to preventing a tangled mess. 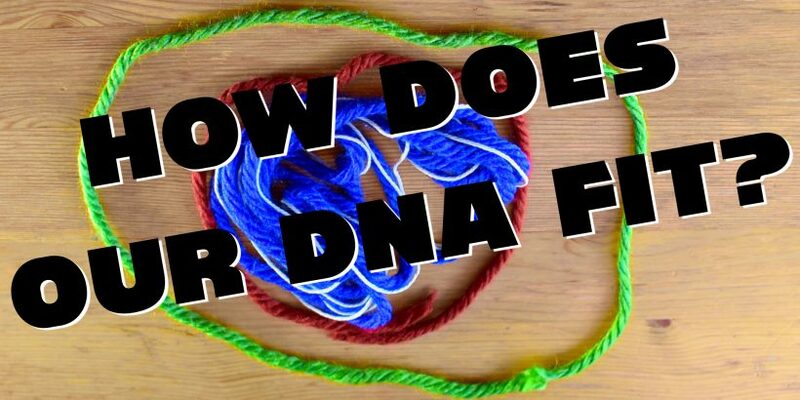 After that first level of folding, there are two major ways that DNA could be organized. The first way is what I like to call the Mom Method. With the Mom Method, the DNA with histones is wrapped together creating a thicker coil. Then it’s wrapped again and again until you reach the level of compaction that you need. The other way is what I like to call the Teen Method. In this method, the histone wrapped DNA is disordered. Some parts are squashed together and others have more room to move around. To anyone else, it would look like a hot mess, but the person who made the mess knows exactly where everything is. Obviously, the Mom method is more appealing, and until now, the evidence suggested that the Mom Method was the way that DNA was folded. But a new paper published in Science suggests that the Teen Method might actually be the way that things are done. The paper showcase a new technique that makes DNA appear darker. When the DNA is darker, you can actually see where it is and what it looks like in the nucleus of cells! The researchers looked at both dividing and nondividing cells to see if they could find the Mom-like levels of organization that previous researchers saw when they studied DNA outside of cells. To their surprise, they couldn’t find any of the thicker neatly wrapped DNA even when the dividing cell DNA was condensed into the classic X shaped chromosomes. They found that the amount of DNA in different regions changed, but that the level of folding stayed pretty constant. More work will have to be done to double-check their results and to find some order in this disorder, but the teen method is looking pretty good. Maybe now I won’t feel so bad when my room gets messy. I’m just mimicking my cells. Information in the article comes from Ou et al. “ChromEMT: Visualizing 3D chromatin structure and compaction in interphase and mitotic cells” Science (2017). « Plant Defense and Disease Resistance!